The time has come! Our first load of logs was delivered a week ago. 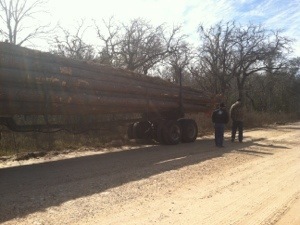 We received a call from the log delivery truck at 10:30 on Sunday morning. He was in the area and needing directions. We loaded up in our cars and met him on the main road in La Vernia and he played follow the leader to our land. It was so surreal to be driving, looking in the rear view mirror at a huge truck filled with fresh cut pine logs following me… knowing those were the WALLS of our new house. He pulled up in front of the land and started unloading. It went from scary to thrilling in one second (for me, at least). I had woken up that morning a nervous wreck. Can’t quite recall the last time I received a log delivery. We had 0 arrangements or plans for anyone to meet us out there or help in any way. For all we knew…it would just be Steve and me trying to move the logs that day. I prayed (as always), asking Jesus to send whoever He thought we needed…if anyone, and to help me not to worry or be anxious. After all, if this was His plan for us, surely He wasn’t going to leave us hanging in such an unusual and demanding situation. 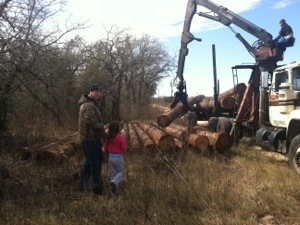 As the log truck pulled up, our neighbor Jacob came out, and stood right beside us, ready to lend a hand. God was already answering!! While they were puzzling, i kept thinking about our friend Shawn. This was something I thought he would be good at. Interestingly, Shawn texted me and said he was on the way over! God again!! Remember Shawn? He helped us tear down Pat’s house to build The McGuire House (“Buying a 25’ Tall Teepee”). Shawn watched what they were doing, and put in his two cents worth, and before you know it, we had a system!! 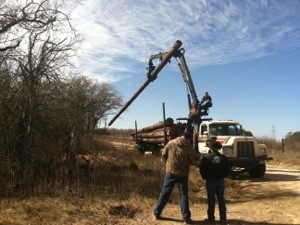 Logs were moving with no problem. We got them dragged to our “log preparation area”. (I can’t believe we have such a thing.). God sent over the perfect crew to help us! Next came trenching. A log home such as this one does not need a concrete foundation, or to be built on pier and beam, like other houses or structures. Instead, we rest the base logs on “pier blocks”. In our case, they are pyramid shaped and tall. There are very particular measurements we have to use, calculated by the many engineers of Log Home Builders Association. We first build the piers from plywood, place them where they belong in holes dug along the perimeter of the house, fill them with concrete, and then pull the plywood form off, leaving the concrete…ready for logs to placed on. But for now…first things first… we needed to figure out the perimeter of the house by stretching out strings on batten boards. Out came the tractor and Steve started digging a deep enough trench to lay pier blocks in. After many days worth of digging, that task is now completed. Our lunch breaks and breathers are spent in our new picnic area by the ever-hot smoker, enjoying homemade, smoked venison sausage, burgers, and today’s fajitas. It’s a rough life, but someone’s got to do it! Friends, family, and our kids have tried their hand in log peeling. (It’s too bad logs don’t molt like snakes.) We got two spades to scrape the bark off the logs with. It’s fairly easy for men…taking about 1 hour per log, or less, but is taxing for kiddos. It sounds like crunching potato chips when it’s being scraped off. If only I had some dip or salsa. Our good friend Jeremiah arrived from West Virginia a couple days ago. He is staying with us for a month to help build. He and Steve dove right in. Reiley and I marked the pyramid wall shapes on the plywood and the guys cut them out and assembled them. Family bonding time. The first logs are about finished and ready. They have been measured and numbered. Our home base is in full swing… log prep area, picnic area, building area… can all be seen in these pics. We’re having a party out here! Lol. Thank you also to Dixie, my mother-in-law, for the numerous hot dinners she has made for us at her house on our weary ride home at night (like tonight). 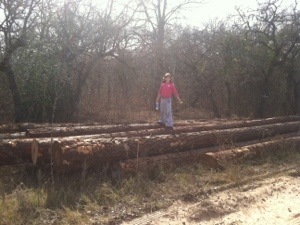 We are expecting more logs this Sunday (27th). The concrete truck comes to fill our pyramid piers on Monday or Tuesday. Log peelers (wanna try it?) are arriving Monday and peeling til they are done, all week. The first logs will start being stacked around Tuesday (29th) of this next week! It will take about 2-3 weeks to erect the whole structure. We have gotten over 1500 views on this blog so far. (I am in awe!!). Tons have emailed or private messages me on Facebook, or corresponded with my husband, encouraging us, thanking us, and telling us what a powerful ministry this process has been to them, or they are wanting to come watch or help. Any and all are welcome to come! My email is gretphoto@yahoo.com. Feel free to contact me if you have any questions. Anyway… I guess I need to stop blogging and get back to work. As I type, I am sitting out here in the picnic site, dodging bees, waiting for fajitas to be ready. Time to be useful again (or at least appear to be). Stay tuned for more! The next post is “Whack-a-mole and Seesaw“….click the link. Or, if you just stumbled onto this post, click on “What do Vegas and logs have in common?” to see the very beginning of our log home building process. Or, click on “What is Cottonwood Creek?” to see what this blog is about. Posted in christianity, construction, faith, family, inspirational, jesus, log cabin, log home, log home building, log house, UncategorizedTagged log home, log home builders association, log house, logsBookmark the permalink. You guys are moving wright along.